After a phenomenal tutorial, I really felt that I had a number of quite key points to act on in order to develop my ideas. On reflection, knowing the impact of these moves on how I am thinking now, I should have stuck with my original intentions for the Final Project from the start in terms of scale, although I do understand the value of experimenting on a smaller scale. 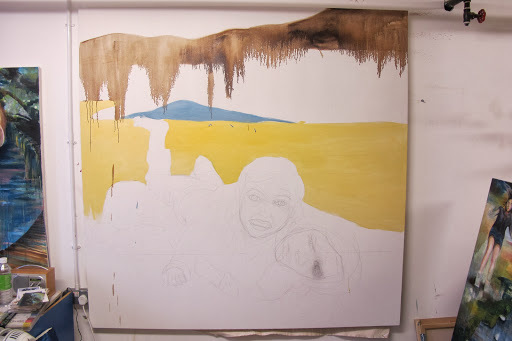 However, I am trying to capture a more gestural and spontaneous sense of paint on canvas on a larger scale – there is no way that I will be able to develop this technique by working smaller then realizing bigger. Anyway so I enthusiastically made my canvas stretcher, quickly realised that my existing canvas rolls are far too small to stretch over so had to by a huge roll at great expense of 256cm wide canvas – can’t physical carry or drive it anywhere whole…certainly this is an incentive to make many more larger scale pieces. 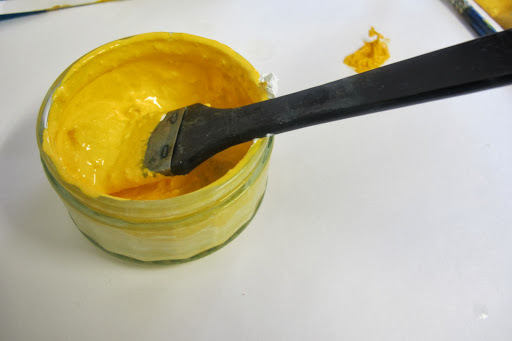 An idea that we discussed was how I layer and use lots of different colours all over the surface of paintings – the eye can only travel a short distance until it encounters another colour which may interrupt the flow of the work. I have tried mixing pots of colour rather than mixing as I need more on a palette to reduce this variation in tone which is sometimes due to time lapses between colour mixing. It is very difficult yet again to break making habits but I have tried to paint more blocks as a base to apply the initial colour – this goes against what I believe works aesthetically but does allow me to work up some areas with more detail to guide the viewer and limit the colour palette to some extent (all the work I have looked at seems to have some palette limitations imposed to a greater extent than I have been). Green is banished for the time being. Just because the settings are outdoor does not mean that the environment needs to be green! 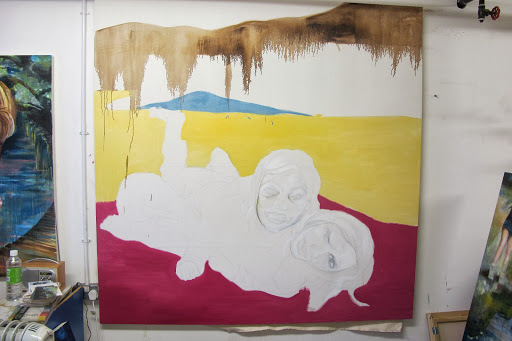 I may however, experiment with a green shade as under painting later on so there is a trace or fragment of green. It has been great to get making and build on the momentum of new feedback. I hadn’t realised that yet again I had settled into my making habits, but with a studio rearrange and the twin painting from the summer visible I am trying to draw on elements that worked and break from those which didn’t. I will try to continue to paint instinctively rather than picture making as I believe there is spontaneity in this which may translate well on the canvas. The process of painting instinctively is easier said than done. I have tried some techniques which have loosened up my making process e.g. spontaneous mark making and mono print. I have played more with using larger brushes and obliterating sections of the image. 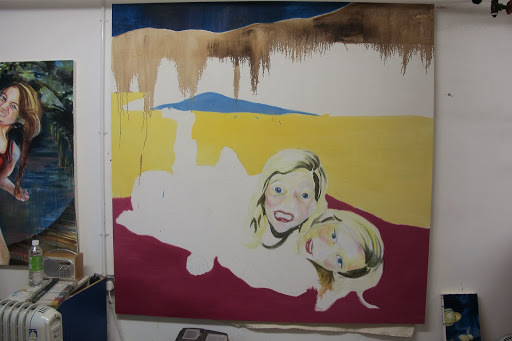 I haven’t done much to this big painting since this point – the faces seem static still but the balance is better where there is loose painting and drawing in other areas. I don’t think it matters that I haven’t moved this piece forward as the early process and bravery needed to make this painting marks a change in my practice. I also have continued to break from my making habits which according to my time plan, I have built in enough time to do more playing and experimentation before I start to generate my final show body of work. 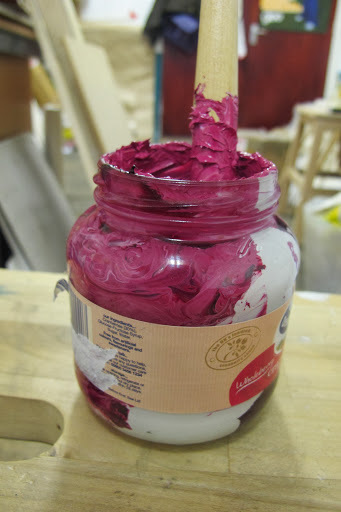 Examples of pots of paint for block painting. Image 1 – Diagonal composition (top left to bottom right). Block colours to describe environment – white as yet no decision about colour. 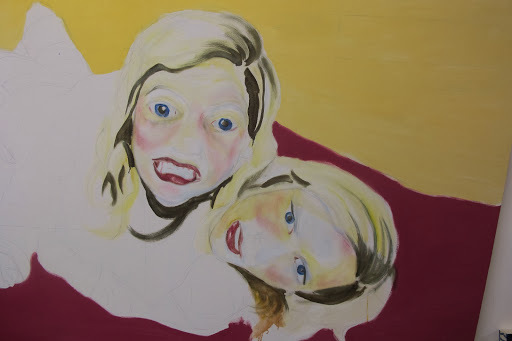 Image 3 – Used minimal colour to add to faces – trying to get a balance between fixing and remaining fluid, using under painting techniques with a possibility of not adding extra layers. Also using similar palette to background (still avoiding green) to unify the surface. Image 2 – Added ‘crimson lake’ to foreground shape building on previous research into colour perception foreground and background. I realise that the figures already seem fixed due to white block shapes, however these fundamental shapes can change with the evolution of the composition.